The 2nd International Science Symposium will cover various topics encompassing HIV epidemiology, pathogenesis, host-virus interactions, immune responses to infection, disease progression, opportunistic infections, co-infections, current treatment strategy, natural history, vaccines and other infectious diseases not limited to STDs, TB and viral hepatitis. Prof. Françoise Barré-Sinoussi, Nobel Laureate & Discoverer of HIV will be delivering keynote address. 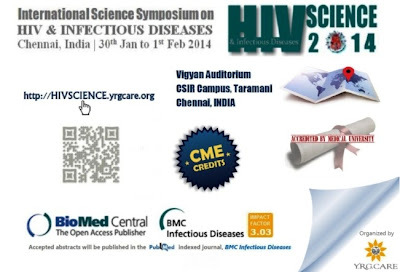 Scientific session on “HIV Cure Research”. 25 CME credit points accredited by Medical University, Chennai. Accepted abstracts will be published in the PubMed indexed Journal, BMC Infectious Diseases (Impact factor 3.03). For details on abstract submission, click HERE.